Well it’s officially 3 days before my first Marathon (Charlotte Thunder Road, Dec 12th). There is a lot going through my mind right now. I am going to sum up the feeling as anxiety & nervousness mixed with confidence. Over the past 4 months I have stuck to a strict intermediate I Marathon Training Program, provided by Hal Higdon- yet I still feel that I could be more prepared. Workouts have been very light this week to continue tapering and avoid lactic acid build up. My legs feel ok, with the exception of my left quadricep and achilles, which I injured running in the mountains Thanksgiving morning. Today I actually went to a sport therapist for any relief prior to Saturday. 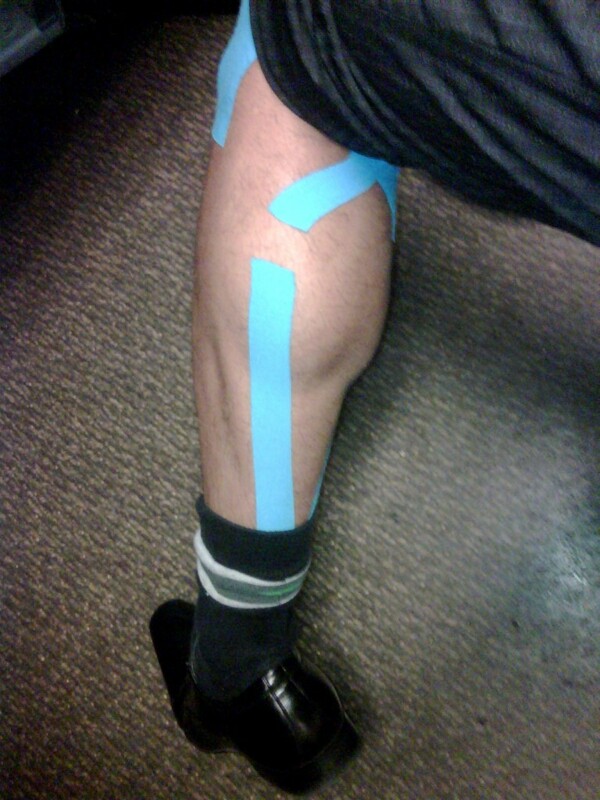 Work was done in the area that was causing the pain (massage, electrotherapy) and kinesio tape was applied for comfort and stability. Meals have been consistent with a normal week before a race. Sound sleep is key tonight and Friday, so I am cutting this short. What do you do after your double digit run? Everyone has their own ritual, and recently I have adopted one that helps speed my recovery. A good running friend (Tony Jabon) suggested that I try an ice bath after a long run to keep my legs from becoming sore the following day. Believe it or not it worked, not only the first time, but sequentially since then. * Cold Therapy or (Cryotherapy) decrease cellular metabolic activity and constrict blood vessels, resulting in reduced tissue breakdown and swelling. * After exiting your ice bath, your tissues underneath warm up the blood flow faster. This allows for oxygen to improve cellular function- resulting in built-up lactic acid being flushed out, returning it to the lymph system to be recycled by the body. * Too much lactic acid can cause poor muscle function- if allowed to build up over time, the athlete can experience tired, heavy legs. * Immersing the legs in cold water produces a longer lasting change in deep tissues and is more efficient for cooling many muscles simultaneously than using ice packs. Once the athlete has reached the “numbness” stage, they should remove themselves from the ice, or cold water (normally all the ice will melt.) Depending on the length of your run, you should stay in between 5-20 minutes. Before you long run, visit your local grocery store and buy 3-4 large bags of ice. Store them in a cooler at your house. Going to the store after a long run is the last thing you want to do. After your run, fill your bathtub with all of the ice. Turn the cold water on, and fill the bath tub with enough water to cover the hips. Keep your running socks and shorts on; grab a sweatshirt, thick hat and something warm to drink. Book, cell phone, or something else to keep you occupied is optional, but helps. Ok- this is where it gets tough. This might not work for everyone, but just get in. Avoid screaming, just take deep breaths. After about 10 minutes your legs will become acclimated to the temperature and go numb. Runners and athletes are not the only ones that benefit from ice baths. In the October issue of Rolling Stone, Madonna says that she comes home and sits in an ice bath for 10 minutes after performing. (“Madonna Looks Back” 53). If you have never tried an ice bath, I highly recommend it. Just for fun, last Sunday I took a video of my ice bath. Over the last 12 years I have been running races and working out religiously, but have never done a Marathon. For those not familiar with the term Marathon, I included a brief history borrowed from Wikipedia: The marathon is a long-distance foot race with an official distance of 42.195 kilometers (26 miles 385 yards, or exactly 267⁄32 miles) that is usually run as a road race. The event is named after the fabled run of the Greek soldier Pheidippides, a messenger from the Battle of Marathon to Athens. Some would ask why I have never done a marathon, and my answer is simple- I never wanted to dedicate that much time to running. This year, 2009 will be the year that I finally get a marathon under my belt. I will be running Charlotte’s Thunder Road Marathon on December 12th. With the race only a few weeks away, training will be my major focus. After a bit of research, I have decided to follow Hal Higdon’s Intermediate Marathon Training Schedule, which can be found here. So far the program has been working well. My legs and body are gradually adjusting to increased mileage without any injury or pain. It’s that time of year again! Over the last decade, my family and I have participated in the Virginia 10 Miler, held in Lynchburg, Virginia. This is not your average 10 mile race. Take a look at the race map, and you will see there are some gruesome hills. The first time I ran the race was in 1994 with my father. The following year, my sister and mom joined in. Over the next five years, we all participated together. During my first year of college (2001), I went on a running hiatus and missed two years of the race. I returned in 2003, and have been running ever since. After my sister went to college (2002), she abandoned running completely, but still has some awesome times under her belt. My mom has scaled back to the 4 Miler, but still enthusiastically signs up each year to stay consistent. 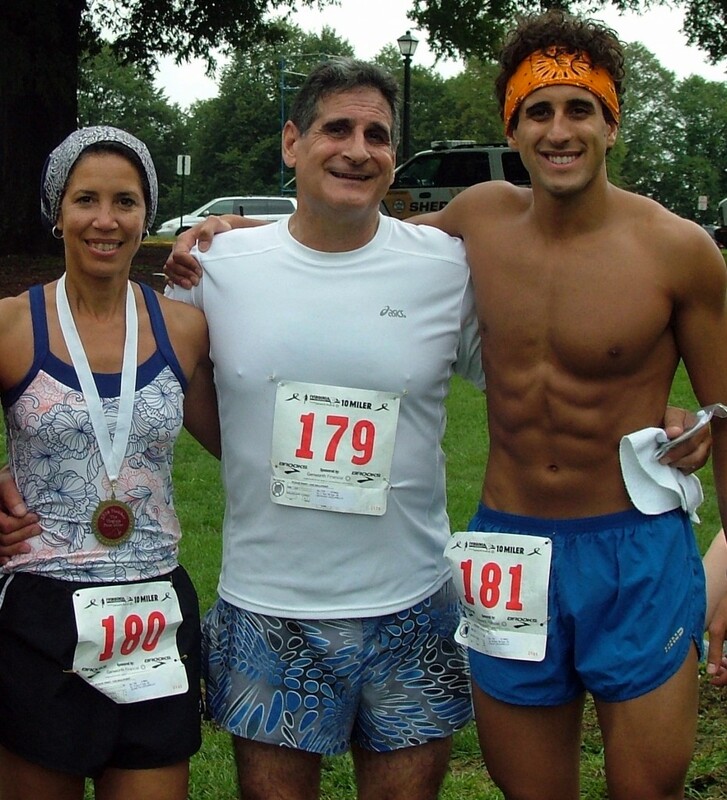 Here is a 2008 picture of my mom (Jeanette Ciccarello), dad (Anthony Ciccarello), and me (Philip Ciccarello) – Post-run. This year there are over 1700 people registered for the 10 & 4 Miler, the largest participating group yet! I can’t wait to get back to my hometown, and run some hills.